ZMF was founded by Mario Zucchetti in Antegnate in 1975 and it immediately began to specialize in hot brass forging. The plant consists of 25,000 covered square metres on an area of 50,000 square metres. ZMF is part of a historical Italian industrial group that refers to the Zucchetti family. Today it comprises 4 companies all located in Northern Italy. In 1996, ZMF obtained UNI EN ISO 9001 certification, ensuring overall production process quality. In 2001, the traditional brass processing is developed with the aluminium one. In 2006, an innovative finite elements simulation system was introduced, allowing the company to evolve from a hot forge for taps and fittings, to a firm specialized in forging non-ferrous, multi-alloy metals, with exceptional added value services. In 2008, thanks to the investment in skilled technicians and advanced machinery, ZMF specialise in the processing of other non-ferrous alloys such as titanium, nibral and bronze. Bringing advanced technological solutions to hot forging processes, offering customers total consulting and assistance through the use of continuously innovative tools. This is ZMF’s mission today. Beginning with the customer’s design through careful study and indepth testing by technicians, the job is analyzed by a special finite elements simulation software. With the obtained results, one can proceed with production with a very high forging process accuracy rate. Often product layout can be adapted to the process for improving quality performance and optimizing production. 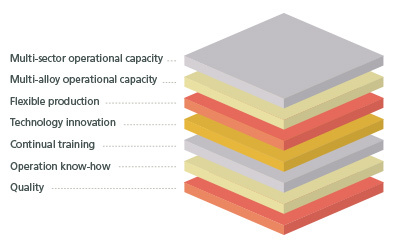 Operational capacity in different sectors – full range of non-ferrous alloys – multiple quality standards that adjust to the market’s needs. L’azienda ha conseguito nel 1996 la certificazione UNI EN ISO 9001 che garantisce la qualità del processo produttivo nel suo complesso. 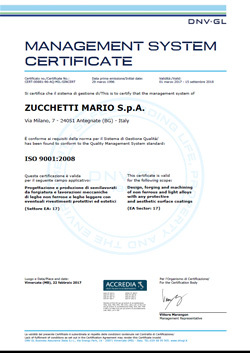 A company by: ZUCCHETTI HOLDING S.p.a.